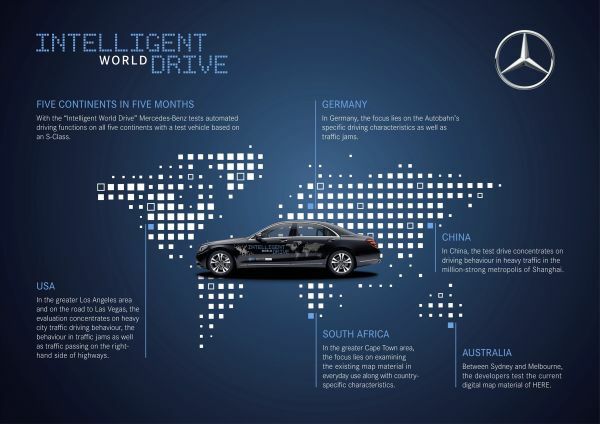 With the "Intelligent World Drive", Mercedes-Benz is testing automated driving functions on all five continents using a vehicle based on the S-Class. At the International Motor Show (IAA) in Frankfurt, Dr. Dieter Zetsche, President and CEO of Daimler AG and Head of Mercedes-Benz Cars, fired the starting gun to send the test vehicle off on its worldwide test drive. The test vehicle is based on the new series production saloon. Between now and January 2018, this S-Class, which has been automated for test purposes, will face a variety of complex traffic situations. In the process, it will gather valuable experience on the road to autonomous driving. After the launch in Germany the next test drive will take Place in China followed by others in Australia in November and South Africa in December. The final stop of the tour will be the CES in Las Vegas in January. The purpose of the "Intelligent World Drive" is to collect information on what happens under real traffic conditions around the world, so that future automated and autonomous driving functions can be brought into line with country-specific user/traffic habits. "Recording, processing and interpreting highly complex traffic situations is the key to safe automated and autonomous driving. This is particularly demanding in dense urban traffic. This is why we are deliberately testing our automated driving functions in everyday driving situations in large cities", says Ola Källenius, Member of the Board of Management of Daimler AG responsible for Group Research & Mercedes-Benz Cars Development. "In this way not only do our vehicles become more intelligent, they also become safer." In addition, the Stuttgart-based automotive company is an advocate of an internationally harmonised legal framework for automated and autonomous driving. There is a need for action especially in relation to international agreements on road traffic law, which set the binding framework for national legislation and which currently still compulsorily require a driver. Further changes are also important with regard to vehicle certification as well as data storage. "Progress must not stop at national borders. Legislation must keep pace with technological development. 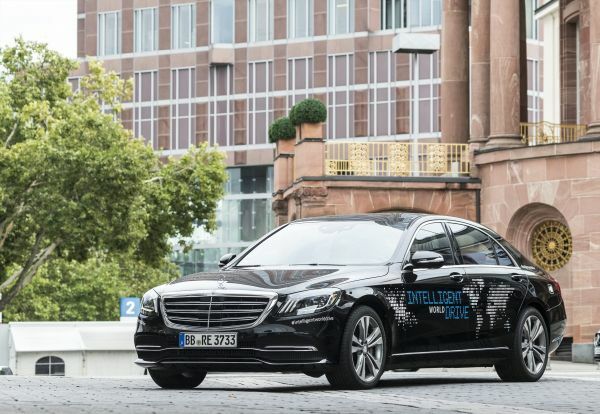 Otherwise it will not be possible for important innovations in automated and autonomous driving to hit the road," says Renata Jungo Brüngger, Member of the Board of Management of Daimler AG, responsible for Integrity and Legal Affairs. "Legal certainty is essential for the acceptance of autonomous driving in society. So we quickly need further international harmonisation of the legal framework." Autonomous driving is one of the four strategic areas for the future which form an integral part of the corporate strategy of Daimler AG under the acronym CASE. CASE - these letters are shaping the future of mobility. They stand for Connected, Autonomous, Shared & Services and Electric. The aim is to provide intuitive mobility for customers by intelligently intermeshing all four CASE areas. While the main area of interest in Germany is specific driving behaviours on motorways and in traffic jams, the focus of the test drive in China is on driving behaviour in the dense traffic of Shanghai with its millions of inhabitants.
. The test drive in the Los Angeles area and afterwards on to Las Vegas will concentrate on an evaluation of driving behaviour in dense urban traffic and traffic jams as well as traffic overtaking on the right on highways. As lighting also plays a key role on the road to automated and autonomous mobility, Mercedes-Benz's "Intelligent World Drive" is additionally testing a prototype headlamp featuring innovative DIGITAL LIGHT technology. This revolutionary lighting system allows features that were unveiled as a vision of the future in the F 015 Luxury in Motion research vehicle in early 2015. The non-dazzle continuous high beam in HD quality uses chips with over one million micro-mirrors, and therefore pixels, per headlamp. Among other things, DIGITAL LIGHT is thus able to project light corridors onto the road in order to communicate with the surroundings.